NHL News : Breaking: Beloved NHL goaltender is walking away from his team. Breaking: Beloved NHL goaltender is walking away from his team. We have some very troubling news to report. 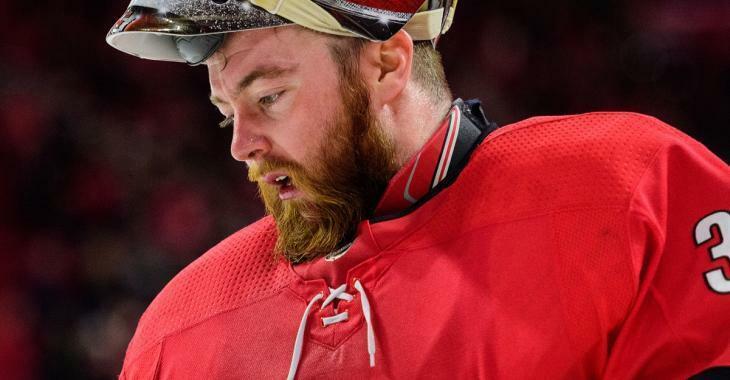 According to a report from Carolina Hurricanes insider Chip Alexander of the Raleigh News & Observer, veteran goaltender Scott Darling will be walking away from the Carolina Hurricanes after requesting a leave of absence from the team. It's unclear at this time how long Darling is expected to be away for but given that his team is in the middle of the 2018 - 2019 National Hockey League regular season, and perhaps more important in the middle of the hunt for the 2019 Stanley Cup Playoffs, the timing of this move raises some serious alarm bells. Alexander reports that Darling made the request through his agent and at this time it appears that the motivation for the move is unknown. Alexander however was able to reach Carolina Hurricanes general manager Don Waddell who did confirm that Darling would be taking a "personal leave of absence." Additionally when asked for reasons as to why the veteran goaltender was stepping away from the team Waddell also provided some vague details by stating that Darling "from a mental standpoint needs to regroup, basically." Now this would be a cause for concern regardless of which NHL goaltender we were discussing in this situation, however the fact that this is Scott Darling we are talking about raises some additional concerns, very serious concerns. Darling's mental health has always been a point of concern during his time in the National Hockey League, specifically his issues with social anxiety, largely due to the fact that it was those mental health issues that drove him to abuse alcohol in large amounts as he attempted to self medicate his problems. The problems got so bad in fact that Darling eventually found himself let go by his goaltending coach and cut by even the worst team in the minor leagues. In 2011 however he decided to turn his life around and quit drinking, and miraculously made his way all the way back to the NHL as a back up with the Chicago Blackhawks. His stellar performances in Chicago would eventually lead to a long term contract with the Carolina Hurricanes and I can't recall a single fan in the hockey community that was not happy for him and that did not celebrate the way he had turned his life around. Darling's success however has seemingly dried up completely in Carolina where he has never lived up to the big money deal the Canes gave him following his time with the Blackhawks, and it's not hard to imagine how that kind of pressure could cause issues for someone with social anxiety. I of course don't know that Darling's mental health is what is causing the issue here, and we will likely never know unless Darling decides to open up about it on his own terms, but if that is indeed the case I wish him nothing but the best and hope he makes a full and speedy recovery from whatever it is that is ailing him. We will be monitoring this story closely so stay tuned for more updates if you're concerned about Darling's status moving forward.